I’ve been sitting on this one a while as it is a part of one of my favourite memories. 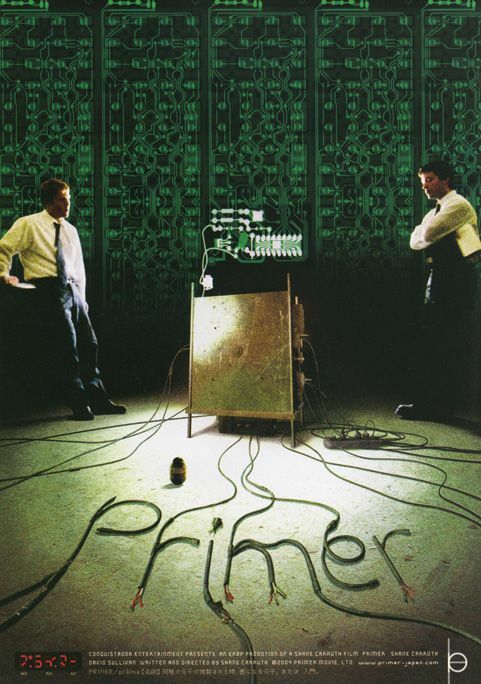 The first time I watched the amazing hidden gem, Primer, was with my younger brother. Baffled after first viewing, we spent a couple hours online and with pens and paper trying to map out the whole thing. After that, we headed back into the living room and watched it again on the same night (while standing on an ottoman for the second half since we saw a silverfish and were too scared/ enthralled in our re-watch to deal with it). I wish I still had the chicken scratch timeline map we’d created during watch #2. Somewhat like Predestination, this is not a movie to watch while cruising twitter. Seriously, this is a lesson, bring a pen. This movie is as confusing as it is groundbreaking. On a minimal budget with suggestions of science magic, these 4 friends embark on a journey of time travel that tests every fiber of them and their very humanity. As these guys fit in the category of your average middle class ‘guy,’ it becomes more relatable than, say, Biff Tannen’s experience in time travel. While this movie is an actual mindF*** (I’m looking at you, Inception), it is ultimately completely sensical and follows a specific set of rules making it reconcilable with some attention. That’s because Shane Carruth, writer, director and star (he also composed the score), is a software engineer and mathematics major turned filmmaker. He planned every second of this movie so well, that you’ll know it makes sense, but probably have to draw it out at least once. While this trailer isn’t TOO spoilery, I definitely prefer that I went into this movie fresh (I didn’t even know it was about time travel for a bit). That said, give it a glance to see the tone and vibe of it all. It’s not the sparkling epic of your average time travel movie, it’s a much more subtle approach to the genre. Also, if you’ve studied software engineering at all (I have in a very removed way in a philosophy course on the functions of the human mind, so I mean it when I say “at all”), you will really pick up on how those functions were important in the mapping of this flick. Watch this one when you’re still awake enough to spend time and attention on it. For me, that meant a 4 am re-watch standing on an ottoman. Aka, absolute perfection in movie viewing.